Dragon1 is a digital platform for you as a business professional to create and monitor solutions with for building future-proof enterprises. The platform has a section for social business networking and a section for business process modeling and enterprise architecture. To make it easier for you to learn and use Dragon1, to deal with your challenges and to get support in all your work, we have created a Step-by-Step guide for you. You may call it Dragon1 for Dummies and you may call it a Getting Started. Either way, you do not need any knowledge beforehand and it will definitely get you started. Below is a sheet from the Step-by-Step guide giving you an overview of the important Dragon1 modules and features. The Step-by-Step guide is targeted at all business professionals out there. Whether you are an IT manager, systems developer, enterprise architect or business analyst, this guide is of use for you. These 4 modules are set up as real lessons and you can follow them in your own time at your own pace. 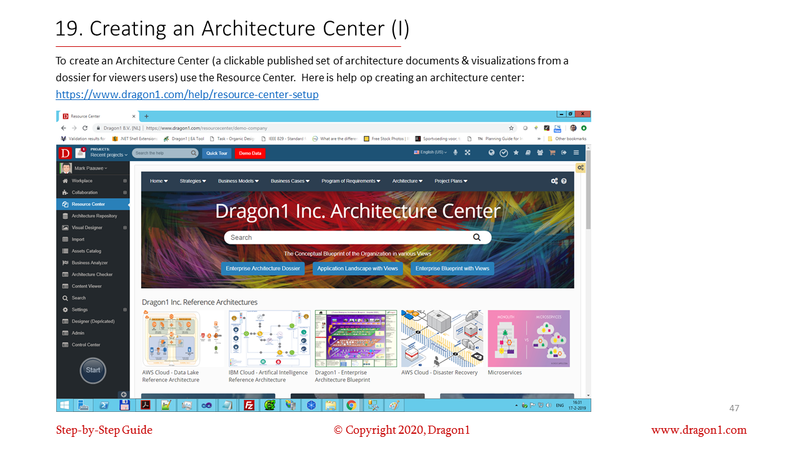 In this module you will to start up working with Dragon1 and configure your workplace for messaging, modeling, sharing and reporting. One of the end results of this module is that you will have a workplace with an overview of all the important things for your work and quick access to that information. 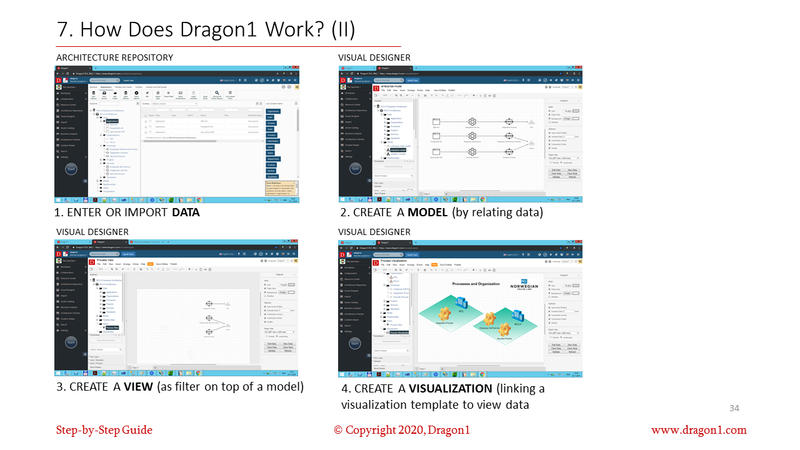 Let Dragon1 do all the work for you if you want to create a model, diagram, visualization or presentation. Make use of templates! The exercise in module 2 learns you to make use of a visualization template like you see here below. Everyone will once need to make a business process model. Dragon1 is perfectly fit for that. You can create formal models and informal diagrams. If you do the exercise in Module 3 you will create a process model that may look like the one below. Dragon1 is a digital platform for the real stuff. 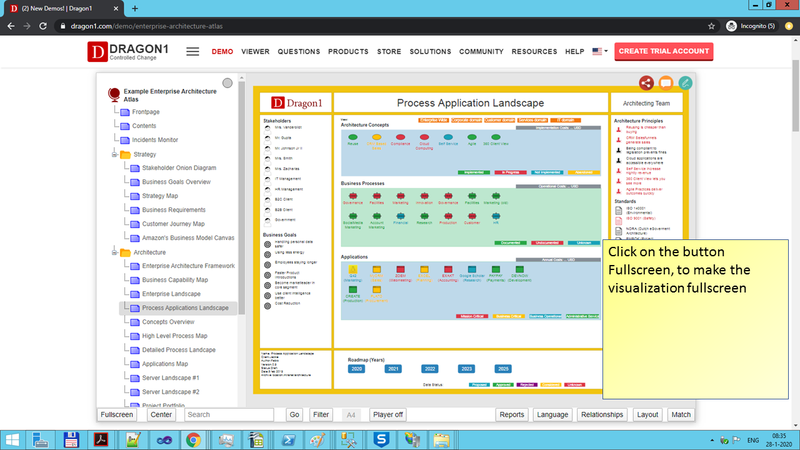 If you need a business blueprint to manage the strategic transformation in your enterprise, then Dragon1 is what you are looking for. Just do the exercise of Module 4 in the Step-by-Step guide and you will create a 2d or 3d business blueprint, like the 2d here below. 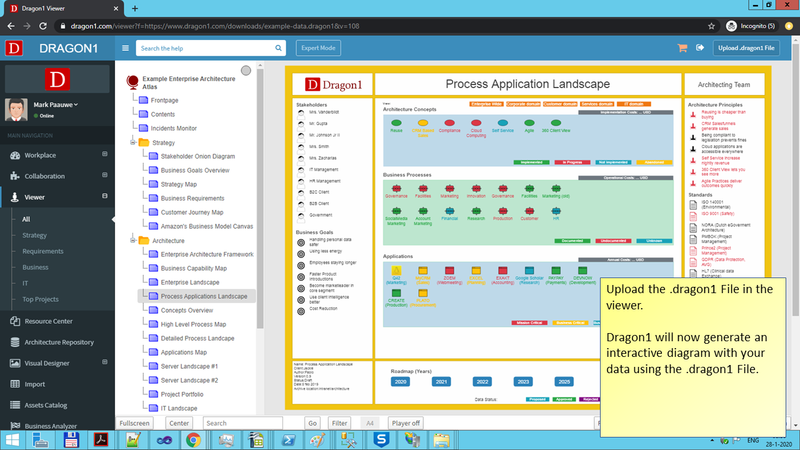 But wait, there's more: you can also generate a roadmap from it and monitor progress on it. In order to download the Step-by-Step guide and to do the exercises, you first need to create an account on Dragon1 here. Click on the next link: https://www.dragon1.com/create-trial-account. Create an account. Login and download the Step by Step and get going by yourself.